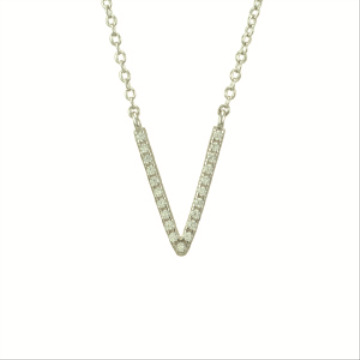 Our CZ angular "V" necklace shines bright for a chic and stylish look. Glistening brilliant cut diamonds trace the delicate "V" design of this contemporary pendant. Twenty nine diamonds weighing .25 carat top this chevron-shaped design crafted in sterling silver. Worn individually or layered with other necklaces, this necklace sparkles from work to weekend.